A month or so ago, I found a deal online for cheap tickets to see Professional Bull Riding at Madison Square Garden. 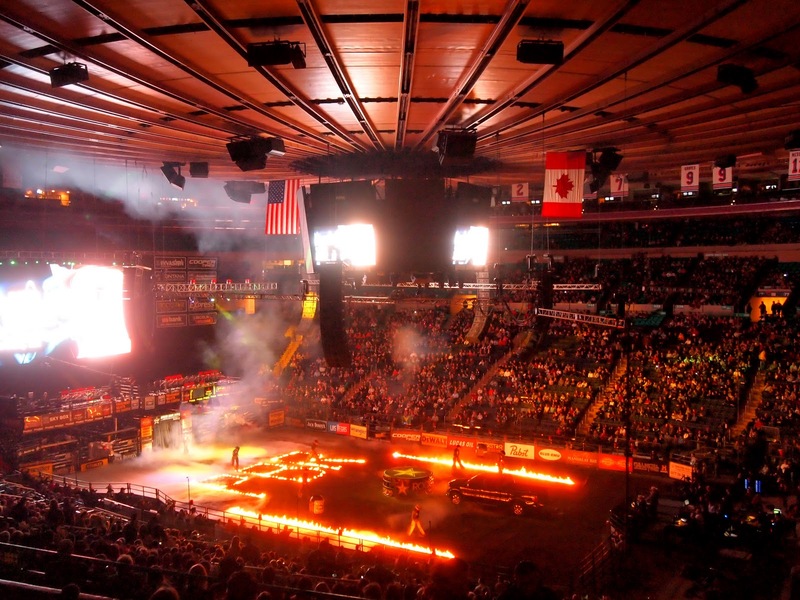 How often do you get to see rodeo events in NYC?! And cowboys?! And bulls?! And belt buckles?! Oh my! I was not about to miss out on that. The event finally rolled around this weekend and I was joined by Kurt, Jenn, Christian, and Will. I was surprised how over the top everything was. Look closely, and you can see PBR spelled out in fire in the ring. 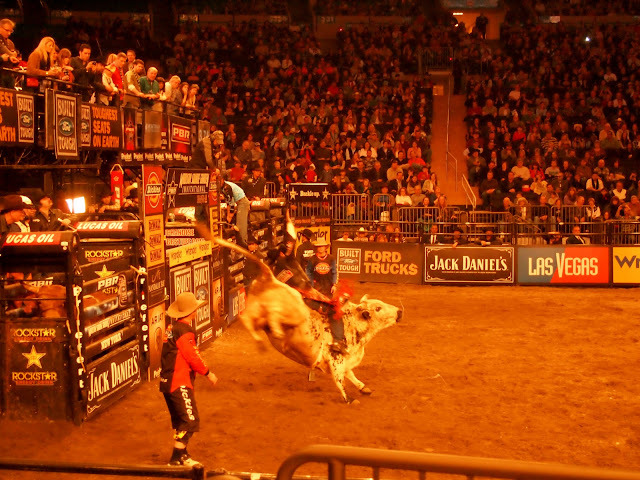 The bull riding was awesome! It's something that really doesn't translate when you watch it on TV. It's something you have to see in person. There were some great rides and energetic cowboys. Luckily, no one got hurt too badly (although there was a broken cheek and two broken legs in the previous days' events) thanks in part to the awesome bull fighters and horseback cowboy. It's a pretty well oiled machine to keep the riders safe. During the "halftime" while they set up for the championship round there were a couple activities for the audience. Here, some bass fisherman competed by casting lines in order to win gift certificates. And an odd little blimp floated around the arena dropping coupons for Western wear. Kurt went down to the ring to get some shots close to the action. You can see the snot coming out of the bull's nose!! Gross!! After 40 rides in the preliminary round and 10 more for the finals, they finally crowned a champion! After bull riding, we went for a drink at the Breslin at the nearby Ace Hotel. The Ace Hotel just oozes hipness. Has anyone ever stayed at one? I'm dying to try it sometime. Vacation anyone?! 2 broken legs, ON THE SAME GUY! Crazy. I was totally unaware that Brazil produces so many bull riders!